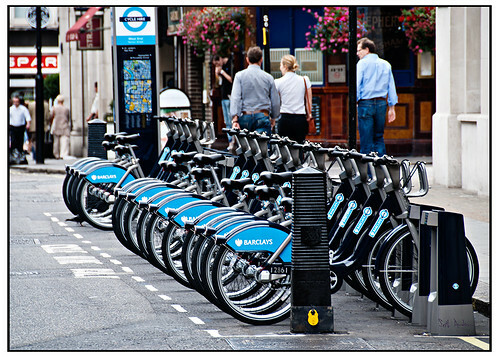 Barclay Cycle Hire appears to be a wonderful alternative to getting on the tube for every little trip. For about the same cost as a ride on the bus you can gain access to bicycles all over the city for the entire day. Here is the quick version of how it works - For the purposes of our blog we have planned staying in a flat right next to Paddington station. Just outside the station is a fleet of blue bikes with a computer terminal next to them. You walk up to the terminal and you insert £2 and you go an unlock a bike. You can then ride the bike anywhere you wish. Let's say we plan to go to Banqueting House to start your day. This is 3.2 miles (5.1 kilometers) through the parks and will take you 25 minutes. Once you get to your destination find the nearest dock and lock up your bike with the other Barclay Bikes. As long as you are under 30 minutes the trip does not cost any additional money and you can check the bike out as many times during the day as you need. You do not always get the same bike back. It is a pass to use the system. If you go over the 30 minutes you will be charged £1. Make sure when you dock the bike, the green light comes on. This indicates that the bike has registered as being returned. There are two downsides for our family - first insurance will not cover you if you are under 14. Though tall and could handle the bikes, half of our clan would not qualify. The other down side is you can only checkout 4 per credit card. We would need to go through the hassle of using multiple cards. The system is part of London Transport and is an excellent alternative to taking the London Tube. London Transport put together a YouTube video on how this all works.